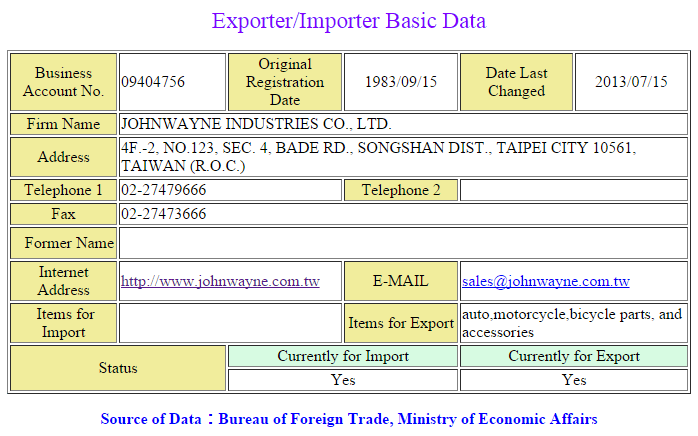 The group founded in 1971 affiliated company, JOHNWAYNE INDUSTRIES CO., LTD. was established in Taiwan in 1983. It specializes in supplying a comprehensive range of auto/motorcycle parts and services for customers, suppliers and end users. Under the guiding principles of "trustworthiness, mutual-assistance, and appreciation," Johnwayne has been dedicated to providing highly professional and flexible services to meet the different needs of customers worldwide. Our professional data center can efficiently handle a wide variety of products supplied by its suppliers for OEM and aftermarket customers, from small items such as fasteners to large parts such as different body parts. We aim to deliver the highest cost/performance value to customers in more than 80 countries. With the help of our professional sales team fluent in English, French, Spanish and other languages. As well as product inspection centers to assure product quality and on-time delivery, Johnwayne has established long-term and stable relationships with global buyers based on trustworthy services. We look forward to becoming your trusted partner in the parts business.